Having introduced us to the basics of the new Code Access Security Model available in .NET Framework 4.0, Matteo Slaviero explains how to use this powerful new system to implement fine-grained code security in ways where have never before been possible. This article is the second of a series of two which introduce how Code Access Security has changed in .NET Framework 4.0. In the first article, we were introduced to the new .NET Framework 4.0 Level2 SecurityTransparence model and given some examples of its implementation. We’ve had a glimpse of the kind of changes which must be applied at assembly level in order to keep our code secure, and we have also seen that, with the new model, the host plays a principal role in defining what kind of resources can and cannot be accessed. from what we saw previously, it seems that the new Level2 SecurityTransparence model is an all or nothing technology; If the assembly is fully trusted, all resources are available, and if it is only partially trusted, none of them are. Thankfully, this is not the case, as we will see In this article. When protecting resources, in order to permit a more granular approach to security, an assembly can be marked with the Allow Partially Trusted Callers Assembly (APTCA) attribute. In this way, Security attributes become available at class or method level, bringing to more flexible configurations. Another important thing we will see is that, with the Level2 SecurityTransparence model, it is now possible to easily protect resources beyond the classical CAS resources defined in the .NET Framework, and we’ll call these new kinds of resources “custom resources”. Finally, we’ll finish this investigation into the new CAS implementation by describing how a new tool, called Security Annotator tool, can help us to discover the correct way to mix the SecurityCritical and the SecuritySafeCritical attributes to implement our desired security strategy. Without further ado, let’s get started. All the classes and methods inside the assembly became SecurityTransparent unless otherwise specified. To specify different behavior, the SecurityCritical or SecuritySafeCritical attributes can be added to desired class and/or method implementations. The APCTA attribute is very similar to the SecurityTransparent attribute used in the previous article, which we used to force an assembly to run as SecurityTransparent. As a result, when the caller assembly tried to access SecurityCritical code, an exception was thrown (remember the PermissionSet property?) As mentioned, the main differences among the two attributes lies in the fact that, when the APCTA attribute replaces the SecurityTransparent attribute, we are able to directly specify security settings for each class or method in an assembly through the use of SecurityCritical and/or SecuritySafeCritical attributes. If the assembly were marked as SecurityTransparent, these two attributes would have no effect, due to the fact that the SecurityTransparent attribute only works at the assembly level, and no lower. Elevate the permissions of an individual class or method, transforming it into a SecuritySafeCritical class or method. By doing so, we grant the class or method all permissions to access protected resources (as SecurityCritical code) while it remains visible to SecurityTransparent code. Essentially, we create a sort of bridge between SecurityTransparent and SecurityCritical code. Keep some classes or methods protected from the partially trusted assembly by marking them as SecurityCritical. When trying to get the PermissionSet.Count value, we get an exception which reminds us that the assembly is marked with the APTCA attribute, so all of its classes and methods are SecurityTransparen, and cannot call SecurityCritical code. Figure 2. Running the demonstration program with fine-grained control of method security level in place. Figure 3. Running the demonstration program with assembly-level SecurityTransparency in place, and no fine-grained control. As expected, the SecurityCritical attribute on the GetCasSecurityAttributes now has no effect, and the method remains SecurityTransparent. WriteCustomSentence(string text): this method writes a sentence, passed to it as input, to the console. WriteDefaultSentence(int index): This method writes a fixed sentence to the console, selecting from among three possible values. The input parameter states which sentence to write. string GetMethodsSecurityStatus(): This method returns, as a string, the Security status of the two previous methods. We have marked the CasWriterDemo.exe assembly as SecurityTransparent because we want to test what happens when the CasWriter.dll assembly is called by partially trusted code. Figure 4. Testing the new demonstration CASWriterDemo program. Mark the WriteCustomSentence method as SecurityCritical, so that SecurityTransparent code cannot access it. Mark the WriteDefaultSentence method as SecuritySafeCritical. This second modification should sound a little strange; after all, the WriteDefaultSentence method is already SecurityTransparent, and so it can be accessed by other SecurityTransparent code. Our executable is also SecurityTransparent, so it can also access the SecurityTransparent WriteDefaultSentence method. However, you should note that the WriteDefaultSentence method uses the WriteCustomSentence method after a sentence has been selected. Figure 5. Running the demonstration .exe without marking the WriteDefaultSentence method as SecuritySafeCritical. As we can see, the WriteCustomSentence method is now SecurityCritical, and cannot be accessed by SecurityTransparent code. You can find the exception associated with this behavior after the “Custom Sentence:” line in figure 5. To quickly recap, the WriteDefaultSentence method is SecurityTransparent, so the main method of the .exe can access it, but when WriteDefaultSentence tries to use the WriteCustomSentence method to write the output to the console, an exception occurs, as you can see after the “Default Sentence:” line in figure 5. The Main method calls WriteCustomSentence, which leads to an exception. A SecurityTransparent method cannot call a SecurityCritical method. (a) The Main method calls WriteDefaultSentence, which is successful. A SecurityTransparent method can call a SecurityTransparent method. (b) The WriteDefaultSentence method calls WriteCustomSentence, which leads to an exception. A SecurityTransparent method cannot call a SecurityCritical method. Figure 6. Using SecuritySafeCritical code to bridge the permission gap between the Main method and the WriteCustomSentence method. … Which is exactly the result we want to achieve. We have protected the WriteCustomSentence method (our custom resource) from the partially trusted assembly (which is SecurityTransparent code) while allowing the same assembly to access the WriteDefaultSentence method! Derived types must be at least as restrictive as base types. Derived methods cannot modify the accessibility of their base methods. Derived methods are SecurityTransparent by default and so, if the base method is not SecurityTransparent, the derived must be marked appropriately to prevent violating the first inheritance rule. Figure 7. An exception thrown from trying to derive a SecurityTransparent type from a SecurityCritical one. As expected, a type load exception is thrown, stating that an inheritance security rule has been violated. Notice that the exe stop working as well; because the exception is detected when the assembly tries to load the CasWriter2 type, it’s not possible to handle the exception through code. Figure 8. Our new demonstration program violating the second Inheritance and Override CAS rule, and throwing an exception. I’ll end this section by pointing that the same rules apply when we develop a class that implements an interface. The implemented method must respect the inheritance rules (the same as those in the table above) in relation to the attributes set for the interface members. 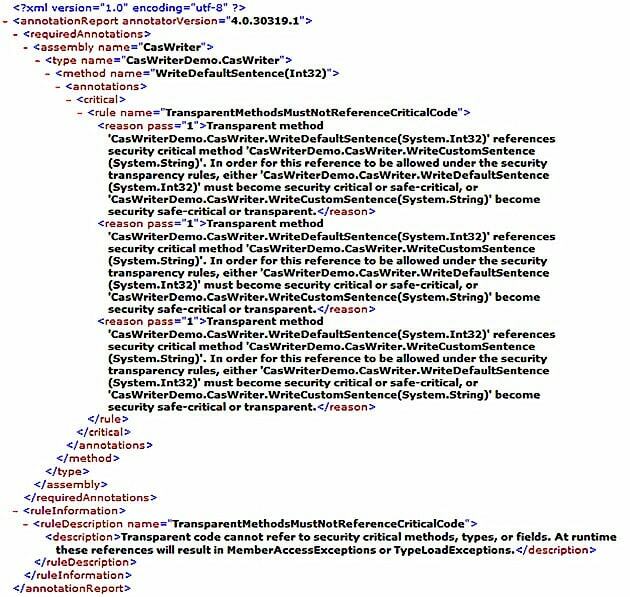 In the previous example we saw how to mix the SecurityCritical and SecuritySafeCritical attributes to protect the WriteCustomSentence method from partially trusted code. Admittedly, that example was very easy and to set the correct attributes was a trivial task. Things are not so easy with more complex assemblies, and there is a risk of creating confusion as you try and unravel the security dependencies. This is precisely why Microsoft’s .NET Framework 4.0 provides a very useful tool, named .NET Security Annotator (SecAnnotate.exe), which can help developers to identify the correct attributes to use in theirs code. You can find it in the Microsoft Windows SDK version 7.0A, under the \bin\NETFX 4.0 Tools folder. The SecAnnotate.exe tool browses an assembly to identify what modifications have to be made to avoid security exceptions when the assembly runs, and checks are made in several passes. In the first pass, the tool discovers what modifications must be performed on the assembly as it initially exists. If it detects that some code must be marked as SecurityCritical or SecuritySafeCritical, it performs a second pass, applying, at run time, the modifications discovered to be necessary in the first pass. The tool then makes a third pass, and if it detects that new modifications are needed as a result of the previous changes, it then makes these modifications in a fourth pass . The process repeats itself (scan – modify – scan – modify…), and ends when the tool doesn’t find anything left to change. At the end of the execution, SecAnnotation.exe generates an output report that contains the result of the analysis performed in each step. re-run SecAnnotate.exe with the /p:1 command-line switch to obtain a new output, and repeat. The procedure ends when no other modifications are needed, as when you allow SecAnnotate.exe to run without human intervention. To perform the check, the SecAnnotate.exe tool has to verify how the assembly’s methods behave in relation to the methods that they call. Usually, assemblies use the .NET Framework base classes, and so checks regarding the attributes needed to call their methods can be performed. If an assembly uses other (third party or your own) assemblies, different from those present in .NET Framework base classes (and, in general, from those contained in the Global Assembly Cache), the path to them must be specified Using the /d:<directory> command-line switch. Figure 9. Running SecAnnotate.exe against our demonstration program. The tool doesn’t find anything to annotate, because the assembly is made up of SecurityTransparent code that calls other SecurityTransparent code (specifically, those code of the .NET Framework base classes which we used). Figure 10. Getting SecAnnotate.exe to do some work on our demo .exe. We can quickly see that the SecAnnotation.exe tool made an annotation in the WriteDefaultSentence method, for three identical reasons. The rule violated is given by TransparentMethodsMustNotReferenceCriticalCode, as we expected. The three reasons are all identical because the SecurityTransparent WriteDefaultSentence method contains three calls to the SecurityCritical WriteCustomSentence method (inside the switch block of code). If they could all, separately, entirely resolve the problem, we know that, for the goals we have in mind, the only available solution is to make WriteDefaultSentence SecuritySafeCritical, in order to grant access to it from SecurityTransparent code, while leaving the WriteCustomSentence method protected. We also know that the tool, after the first pass, applies the rule that it consider to be preferable as it performs its second pass, and that it prefers changes that bring about the best possible security situation. In our example it might have chosen option number 1 and, as a result, the assembly would become fully SecurityCritical, and thus completely protected from SecurityTransparent code. This represents the more secure situation. However, we know that, for our goals, the solution that we need is number 2. Indeed, applying option number 1 instead of number 2 could bring about another round of checks that could have a totally different output, sending SecAnnotate.exe further and further away from our desired outcome. So, as I mentioned, we should probably use the tools with the /p:1 command-line switch, and make the changes manually. Figure 12. Running SecAnnotate.exe against our console application. Figure 13. The SecAnnotate.exe report for our console application. The annotation is related to the Main method, which is SecurityTransparent and is trying to access SecurityCritical code. Note that this is not an exception, but rather the behavior that we wanted to implement in our CasWriter.dll to protect WriteCustomSentence from SecurityTransparent code (such as the Main method). So, when using this tool, analyze the output generated with great care and attention. Beyond all this, there is one last important point to consider. We have written two assemblies, CasWriterDemo.exe and its related CasWriter.dll assemblies, and if we want to use the SecAnnotation.exe tool to check the CAS rules for the entire solution, we simply cannot do it in a single step. In the last example, we analyzed the CasWriterDemo.exe assembly by specifying its referenced CasWriter.dll assembly. However, from the output that we obtained, it’s clear that the checks were only made for the CasWriterDemo.exe assembly and how it behaves in relation to its dependent CasWriter.dll assembly – No check was made for the CasWriter.dll assembly (If you didn’t notice it at the time, the three annotations related to the CasWriter.dll assembly are not present in the later report). The point I’m trying to make is that, if you want to check your entire solution, you need to perform the check for each assembly, one at a time. Unless you have specific security goals in mind, the best way seem to be to check the dependent assembly first, and then its immediate callers. We’ve covered a huge amount of ground in this article (much of which was set up and based on material in my previous CAS article, which you should read if you haven’t done so already). To start with, we’ve seen how to use APTCA, SecurityCritical and SecuritySafeCritical attributes to set up a protection strategy when an assembly must be callable by partially trusted code. We have also seen that the work that has to be done to implement security strategies within this new model is not as easy as we might like, but, fortunately, the new SecAnnotation.exe tool can give us a great head start. Our assembly must protect the underlying dependent assemblies (for example, the .NET Framework base classes). In this case, we need to maximize the amount of SecurityCritical code. In this way, we are able to protect all the dependent assemblies from partially trusted (SecurityTransparent) assemblies with an impenetrable “wall”. Our assembly will be protected by its potential callers. If our assembly needs to be accessed by partially trusted assembly, we need to maximize the amount of SecurityTransparent code. If the assembly doesn’t make use of protected resources, we only need to mark it as SecurityTransparent, otherwise, we must use the APTCA attributes and try, method by method, to maximize SecurityTransparent code and minimize SecuritySafeCritical code. Of course, it isn’t so easy to guess the entire spectrum of possible scenarios and verify if the two rules above are applicable to all of them, so those two must be considered as general guidelines instead. In any case, we shouldn’t enter too deeply into this particular subject at this stage; partly because it is too complex to analyze succinctly, and partly because the Level2 SecurityTransparence model is, at the time of writing, a very new, and not yet sufficiently documented technology. I’d suggest that you follow the .NET Security Blog, which will surely, over time, bring you up-to-date about the new Level2 SecurityTransparence model and its implementations. Matteo Slaviero works as Microsoft .NET Framework consultant. He recently started his own company, Cassandra, to develop new products and services related to the world of cryptography (symmetric encryption, digital signature, X509 digital certificates generation and more). Follow him on Twitter. Running the above code I get the same results as described in fig1, but after introducing the SecurityCritical attribute I dont get the same result as in fig2. The method is still transparent. Have tried on Windows 7 and XP SP3. I use VS 2010 express. Could that be the cause? Has anyone else tried the code? Love this! still relevant and very helpful! What I don’t understand here is it seems there is still a gap that this new model doesn’t address. Prior to .NET 4.0, CASPOL had features to establish rules in the runtime to prevent or allow assembly loading or execution based on evidence, and permissions. If someone were to tamper with your assembly, the runtime would not load it. Whats the use of the Enhanced Strong Naming, and Code Signing if one cant have a tool like CASPOL to prevent hackers from decompiling your code and messing with your assemblies or even dependent assemblies. How is this achieved with this new security model?